Conservative Senate Leader Marjory LeBreton has decided to step down from her cabinet role, but vows to remain an active member of the Tory caucus. The Ontario senator was named to the position after Prime Minister Stephen Harper’s Conservatives won the 2006 election. In a statement, LeBreton thanked the prime minister for what she called "the opportunity of a lifetime." After almost seven and a half years, I have advised the Prime Minister of my intention to step down as Leader of the Government in the Senate. I would like to personally thank Prime Minister Harper for giving me the opportunity of a lifetime to serve in his government and to be part of so many initiatives undertaken by our government on behalf of our fellow citizens, whether it be economic growth and stability, safer communities or courageous and principled foreign policy. Most of all, I want to thank him for his trust, his strong leadership and his friendship. While I will be leaving the position of Government Leader in the Senate, I will continue to be an active member of the Conservative Caucus over the next few years. I intend to step up my efforts in support of meaningful Senate reform and also actively back the new strengthened rules we introduced regarding Senate expenses. In a statement, Harper thanked LeBreton for her years of "exemplary service to Canada" and expressed confidence she will continue to contribute to government work, particularly on the issue of Senate reform. "From our first day in office through to today, Senator LeBreton has contributed her wise counsel, exceptional work ethic, and unrivalled institutional knowledge, and in so doing has made a tremendous contribution to our Government," Harper said. LeBreton faced a difficult few months thanks to the Senate expense scandal that rocked the Upper Chamber, the Tory government and the Prime Minister's Office. LeBreton recently opened up to The Hill Times about what she has called a "trying" time, which saw three Tory senators and one Liberal step down from their parties' caucuses and the resignation of Harper's former chief of staff, Nigel Wright, over an infamous $90,000 cheque cut to Sen. Mike Duffy that is now the subject of an RCMP investigation. "It has been a very exhausting and trying few months here in the Senate," she told The Hill Times' Bea Vongdouangchanh. "We have had to deal with some very serious issues, which I do believe we are dealing with properly. Eventually, it will all be behind us." LeBreton's announcement comes on her 73rd birthday. 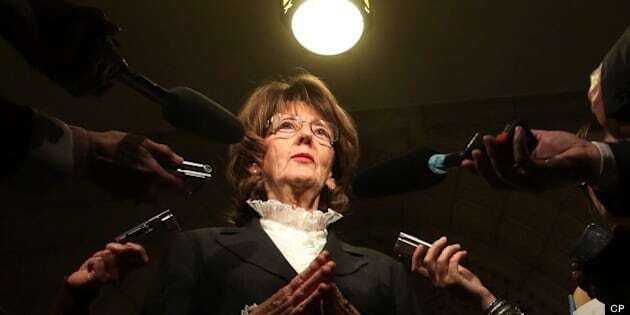 More from the Canadian Press..
OTTAWA — Sen. Marjory LeBreton says she is stepping down as government leader in the Senate. The move comes before a cabinet shuffle expected in the next week or so. LeBreton says she will stay on as a Conservative senator for Ontario. The 73-year-old will have to retire when she hits age 75 in two years. LeBreton is a veteran political organizer who worked closely with Brian Mulroney, who named her to the Senate in 1993. She also worked as an adviser to Prime Minister Stephen Harper, who in 2006 brought her into his cabinet as government leader in the upper chamber.